Collaboration is much sought after — for the allure of its power. In a complex, interrelated, and connected world, Power through Collaboration is the most effective force for achieving your goals. It is the rocket fuel that propels outstanding performance and accomplishment. It optimizes your capability to achieve crucial goals in high stakes situations. The Power through Collaboration books evolved from clientele requests for guidance about how to collaborate in challenging situations even when surrounded by non-collaborative people and organizations. When so much is at stake, people understandably feel frustrated if they find collaboration “confusing,” “hard to do,” and “complicated.” Yet, trying to get by without collaboration does not work. Sooner or later people grasp that Power through Collaboration cannot be harnessed by doing business as usual. It cannot be captured with standard business models and strategic frameworks or simulated by typical self-serving cooperative relationships. It cannot be cajoled with profusions of sanguine advice and quick tips. It cannot even be understood with the conventional mindset. Rather, a fresh framework is needed. If you also are dealing with serious stakes and challenges, you need more than a book of platitudes or proverbial tips that gloss over problematic people and relationships. Superficial guides may not fit your situation, are wrong as often as they are right, offer contradictory advice, and falter in complex situations when you most need help. For guidance to be useful, it is best applied within a coherent framework. Game-changing insight into the psychological foundation that underpins and enables all successful collaboration. 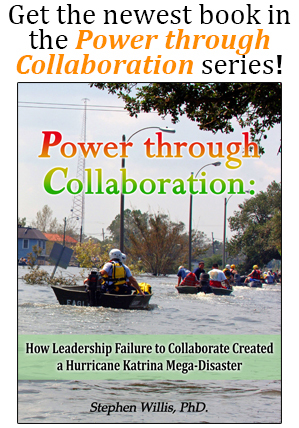 Transformational understanding of what collaboration really is and is not. Decisive capability to use the Power through Collaboration Formula and 7-step methodology to master collaboration challenges and solutions.